Call Now for Your Professional and Efficient Tree Services. Pressure Washing and Gutter Cleaning Available! Serving the Omaha metro area which includes surrounding cities. Certified arborist. Check out the Nebraska Arborists Association website to check for the NAA Certified arborists of Nebraska. Licensed arborist in City of Omaha and City of Bellevue. I continue to attend continued education classes for this trade. pricing is reasonable and affordable. 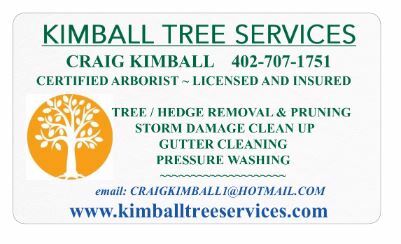 If you need it done, and done well, Call Kimball Tree Services today. We offer personal consultations. Serving the Omaha metro area and surrounding cities, including but not limited to Bellevue, Papillion, Gretna and Plattsmouth Kimball Tree Services, a locally owned and operated company. Call or email Craig for Your free Professional Tree Services Consultation and Estimate.